Located a stone’s throw from the riverfront and night market, the 55-room My Place at Surat is a backpacker favourite with clean, reasonably priced rooms and friendly service. Ad Book now! Rates from US$8++. Average rating 8.4 from 1,484 reviews. Look no further if you’re on a tight budget. Rooms come in a few different styles that will satisfy bare-bones budget travellers and backpackers who can afford to spend a bit more for creature comforts. Up on the fourth floor, the cheapest fan rooms rely on shared cold-water bathrooms, though even these are of a decent size and come with wide glass windows. The next step up comes with fans and private bathrooms, while the rather spiffy air-con rooms bag you a fridge, teakettle, a couple of cushioned chairs, hot-water shower in a wet bathroom and even a painting of orchids above beds with silk pillows in addition to the normal soft ones. Cleanliness is well looked after, WiFi is free and all rooms come with a TV. Cheerful receptionists have a reputation for helpful and honest service; guests who pre-book will likely arrive to find their names written on a welcome board, and you might even receive a postcard when checking out. An attached cafe does fresh coffee, Thai rice plates and decent breakfasts. Staff can arrange tickets to the islands for consistently reasonable prices. There’s no lift, but a staff member will make you feel like you’re staying in a pricier hotel by carrying your luggage upstairs. The excellent-value air-con rooms often fill up in advance; in that case your best bet in this price range would be the nearby Tapee Hotel. Otherwise you could settle on the Thairungruang, an old Chinese-style budget hotel with a reputation for being shifty, located closer to the downtown bus stations on Soi Ruengruang. Next to that is the dire Surat Guesthouse, if you’re after the cheapest of the cheap. Plus 40 baht for twin beds. Room: Dbl fan share bathroom, low season: 260 baht, high season 260 baht. Notes: Plus 40 baht for twin beds. Room: Dbl fan private bathroom, low season: 360 baht, high season 360 baht. Notes: Plus 40 baht for twin beds. 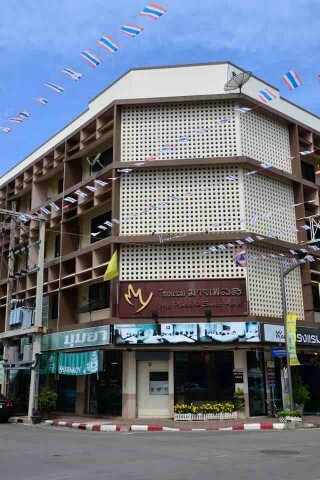 Room: Dbl air-con private bathroom, low season: 590 baht, high season 590 baht. Notes: Plus 40 baht for twin beds. Where are you planning on heading to after Surat Thani? Here are some spots commonly visited from here, or click here to see a full destination list for Thailand.